Facebook Widget for Magento 1 allows you to display the Facebook feed of your Magento store, featuring the recent posts from your Facebook page. Encourage your customers to take more part in your social media activities and draw their attention to the things that matter. Having social media accounts has become a must for any internet-based business. Facebook audience is the most involved when it comes to promotional activities. A compact, but fully functional feed of your store updates allows to inform your audience about big announcements or upcoming sales. Facebook Widget creates a window from your shop into its daily Facebook activity and events. Integrating Facebook feed into your store layout is the sure way to bring your interaction with customers to the new level and increase customer loyalty. Convert your online customers to your Facebook fans and vice versa with a handy tool for customer base growth. Customers enjoy social activities that don’t require much effort and time from them. Facebook widget is giving your customers a possibility to easily access your brand page to share their opinion about an item they have bought from you or the overall work of your store. Get more immediate feedback about your products and see what your audience is interested in. Facebook widget is quick to install and easy to use. It has a wide range of settings and displaying opportunities. Put the widget with your Facebook updates where they will be noticed the most. You can specify the page you want it to be displayed in Layout Updates. The extension doesn’t require an additional Facebook authorization, all you need to do is to make sure the privacy settings of the featured page are suitable for displaying the content in your store. After enabling the Facebook widget in your admin panel you have access to a variety of settings to adjust the widget properties to your store. Change the name of the widget and choose a page for the Store views to be assigned. 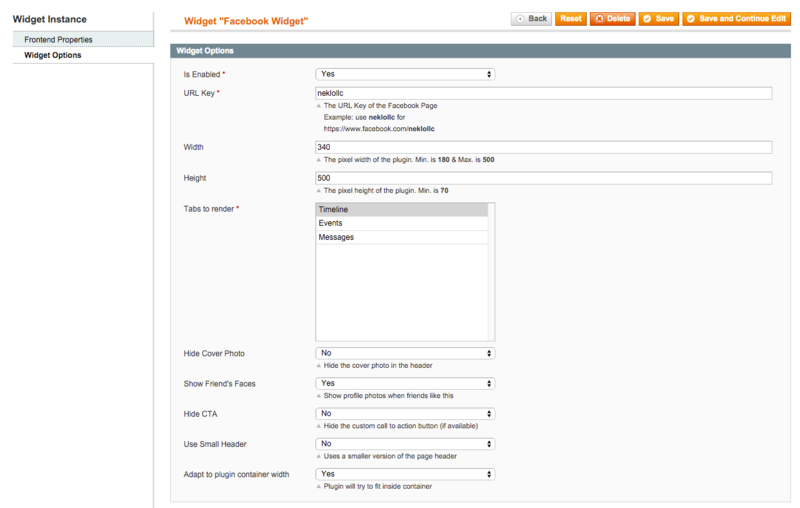 Set the widget dimensions suitable for your page. You can display any page you want by entering its URL key, or display posts by hashtags. Additional options include enabling or disabling cover photo, showing friends’ faces, hiding СTA /button, use of smaller header and adapting the plugin to the container width. In the extension the Facebook page integrated into the store layout looks and works exactly as you are used to it. The feed features like, share and comment buttons and loads new posts automatically as you scroll the timeline down. The extension will make your store layout more user-friendly. Don’t miss the opportunity to establish a stronger connection with your audience and tell them more about your brand through posting and sharing from your company Facebook profile. 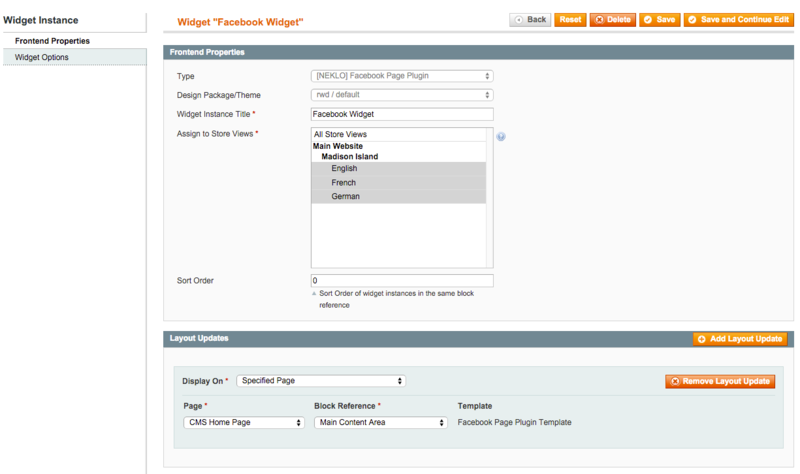 Simple and what is more important free plugin to display your Facebook timeline on Magento website. Thank you guys! Why should I pay for the combiners of social media when I can download only that extensions that are needed (in my case Facebook). Great!